There is a long tradition of American politicians using their offices to barter power and influence and to enrich themselves. I know what you’re thinking—I am about to launch into a tirade about Donald Trump. No, actually, he is by no means the most famous such politician. He isn’t the most famous such New York politician. For who can possibly beat Tammany Hall? But Tammany Hall survived for as long as it did not because it hated people but because it provided for them. If you gave Tammany your vote, you could count on social services and a job at a time when the poor had no services and there was no unemployment insurance or a safety net. Tammany Hall provided that safety net in exchange for your vote. 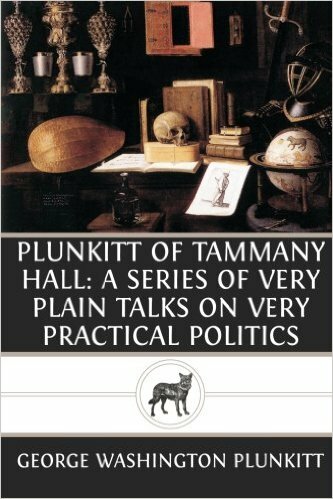 And in a series of frank and disarmingly charming, informal lectures of sorts, Plunkitt revels in this corruption. Plunkitt may or may not be book-educated (in any event, he takes a dim view of people who are) but he does understand people very well. He understands that when you ostentatiously help someone when they’re in a poor way indeed they will remember you at the polls. That (he explains) is why it’s so important to chase fire engines and ambulances. And it’s important to be there when people celebrate life events: from weddings to funerals. That too will get you a vote. And sure, Plunkitt made money off the deal and he provided jobs for his friends (why would he provide jobs for people who were political ingrates?). But as he saw it, there was nothing wrong with that. After all, his business was politics and, since people depended on him doing well in his business (and he did; he did quite well) and people rely on him doing well for their livelihoods, the people’s interests and his interests coincide. What is wrong with that, he repeatedly asks in his disarming and funny way? The fact that Tammany Hall lasted for 150 years and that we have now elected Trump (who asks that exact same question often in exact same words Plunkitt uses) indicates that we have yet to come up with a good answer to that question. Are you OK with political corruption if you get something out of it too? Product Description: A series of frank, disarming, and somehow charming lectures about political corruption.